With winter here, freezing temperatures and heavy precipitation are once again posing hazards for anyone on the roads -- including insurance adjusters. Right when the weather gets worse, the workload for adjusters increases as claims begin coming in. If you are an adjuster, you cannot avoid working in unpleasant and, at times, potentially dangerous conditions. You can, however, take precautions to protect yourself. Winter storm preparedness, for adjusters, is the first step to a safe winter. When preparing for winter hazards, make sure to ready your car. Adjusters spend a lot of time on the road, and a well-prepared car will ensure you are safe in all conditions. 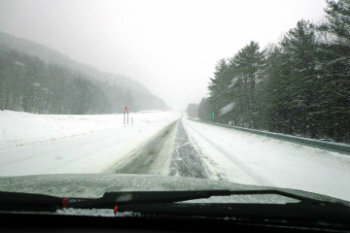 Even if you spin out while driving to a claim, these tips will keep you safe and warm. Hopefully, you will never need to rely on these measures. You will be glad you took these steps if you ever have a problem on the road, though. Winter storm preparedness, for adjusters especially, also includes readying homes for storms. The Claims Journal lists four common winter-storm related insurance claims that homeowners file: fallen trees, ice dams, broken pipes and fires. As an adjuster, it is your responsibility to know how to assess damage from these four causes. You should offer helpful information to homeowners about how they can reduce the dangers these hazards pose. For instance, remind them to have any dead branches on trees cut down in autumn, and remember to leave their heat at least 55°F when away. If you help them before the next big storm hits, they may not have to file a claim. Winter is here, but you can keep preparing for the next storm. Make sure you are safe on the road. For more information and helpful tips for insurance adjusters, contact us at Pilot Catastrophe Services, Inc., today.